Is Bolivia outsourcing too much to China? As Bolivians were preparing to go to the polls on February 21 to vote on a constitutional referendum that would have permitted President Evo Morales to run for a fourth term, a scandal was rocking the country. The affair with Gabriela Zapata not only raised questions about the President’s character, but was also a demonstration of the extent that Chinese companies have increased their presence in Bolivia—often engaging in less-than transparent procurement. The basic details behind the scandal have been confirmed by the president himself. In 2007, or shortly before, the President had a relationship with Zapata which resulted in a child who died shortly after birth. Zapata went on obtain a law degree, and in 2013 was contracted by Chinese company CAMC Engineering, which won contracts worth an estimated US$580 million from the Bolivian state, of which, US$366 million was awarded after she was hired. The timing of the revelations regarding President Morales and Zapata, just days before the referendum vote, was likely no coincidence. Yet the scandal also highlighted how Morales has placed Chinese-funded infrastructure projects, contracted to PRC-based companies, at the centre of Bolivia’s national development strategy. 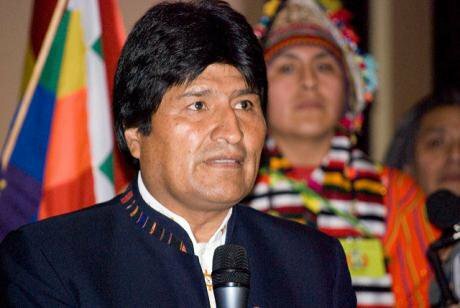 Even prior to assuming the Bolivian presidency, Morales had signaled his interest in cultivating a special relationship with China, traveling to the PRC in January 2006, where he publicly declared himself to be a great admirer of Chinese revolutionary leader Mao Zedong. In the years that followed, due to political instability, uncertain legal protection for companies, and the difficulties of doing business in Bolivia, the Morales government had few successes in attracting Chinese equity investment in sectors such as mining, petroleum or agriculture, despite the country’s abundance of natural resources. PRC-based companies did, however, make enormous advances in selling to Bolivia Chinese goods and services, including numerous public works projects financed by Chinese banks. In the first 15 years of the current millennium, according to the International Monetary Fund, China-Bolivia bilateral trade expanded by a factor of six, from a mere US$75.3 million in 2000, to US$2.25 billion in 2014. Yet, while other commodity-rich Latin American countries were enjoying trade surpluses with the PRC, Bolivia’s US$1.82 billion in imports from China exceeded its exports to the PRC by more than four to one. In Bolivia’s commodity sectors, Chinese commercial activity principally involved sales of goods and services on credit, rather than equity investments by PRC-based firms. Notable examples included the 2011 sale of US$60 million in drilling equipment to YPFB, financed by China Export-Import bank, a contract with the Chinese firm CITIC to explore for lithium and other mineral salts near Coipasa, paying the Chinese firm Linyi Gelon New Battery Materials Company to build a small plant making lithium batteries, paying CAMC Engineering to build a facility for extracting and refining potassium chloride, paying Henan Yuguang to build infrastructure in Oruro and Potosí to refine and cast zinc, and a US$50 million contract with the Chinese firm Vicstar for a tin ore processing facility at the Huanuni mine in Potosí, among other projects. The crown jewel in hiring Chinese companies to provide mining services, however, occurred last month, when the Bolivian government announced a US$450 million contract with the Chinese firm SinoSteel to build and administer facilities to extract and process iron from the country’s massive El Mutún mine. Previously, a contract to develop El Mutún had been awarded to the Indian company Jindal, but had been put on hold because of a contract dispute. In total, 11 of 49 Bolivian public works outstanding in 2015 were awarded to Chinese companies. Thanks to Chinese financing of such projects, by the end of the year, the PRC was Bolivia’s largest creditor, with an outstanding debt to Chinese banks of US$533 million. Despite the possibility of favouritism and the risk of mortgaging Bolivia’s revenues to easy-to-obtain, Chinese-financed projects, an extraordinarily high number of these projects have been also been plagued by delays and difficulties. Work was suspended on an urban bridge being built by the Shenzen-based company Vicstar in Cochabamba when it began sinking into the earth. A highway being built by Sinohydro from Ivirgarzama to Ichilo was paralysed by five work stoppages in 14 months. A US$250 million contract for a railway and road connection between Montero and Bulo Bulo included the award of two segments to Chinese companies: China Railway Road and CAMC Engineering, of which both were rescinded when neither company could complete the work on schedule. In the hydroelectric sector, work by Sinohydro on a US$235 million contract to build the 124 MW San Jose hydroelectric facility in Cochabamba was halted in January 2016 by a strike. Similarly, CAMC Engineering became the target of protests when it ran out of money to pay truck operators who had been working for it on the Misicuni hydroelectric facility. Despite this record of difficulties, Sinohydro appeared poised to win a contract to build the US$1.3 billion, 600 MW Rositas hydroelectric complex on the Grande River in Santa Cruz. Critics charged that the award was rigged when the government gave only 21 days for interested companies to bid, based on a design that had not even been finished. In manufacturing, as in the other sectors previously mentioned, instead of investing in factories, as the Chinese have done in the automotive, heavy equipment, and electronics sectors in Brazil and Mexico, PRC-based companies have built facilities, of questionable utility for the Bolivian state. Examples include an asphalt production plant in El Alto, a paper mill in Villa Tunari in the Department of Chapare, and the San Buenaventura sugar refinery in the Department of La Paz. Bolivian telecommunications company Entel signed a US$120 million contract with the Chinese firm Huawei to provide service to 12,000 localities across the country. Five years later, in 2014, Entel made the Chinese company ZTE the exclusive supplier for building the new FTTx national broadband network. In the space sector, the PRC built and launched Bolivia’s first satellite, including the construction of its ground infrastructure and the training of the personnel for the Bolivian Space Agency formed to administer the satellite, financing 85% of the US$302 million collective costs of the work. Bolivia subsequently committed to contract the PRC to build and launch a second satellite, the Bartolina Sisa, for US$150 million. But the Bolivian government promised to take its engagement with the PRC to an entirely new level in October last year with a US$7.5 billion Chinese line of credit to fund a series of 11 strategic development projects. The realisation of such work by Chinese companies would not only make the PRC the dominant player in Bolivian development, but would more than double Bolivia’s national debt. Particularly in the wake of the current scandal, the Morales strategy of using the PRC to conduct and finance its national development raises multiple concerns. Based on the track record of the Morales government to date, it is not clear that the current regime is effective in choosing and contracting for the public infrastructure projects that most effectively promote national development. Nor is it certain that the regime can work effectively with its PRC-based partners to deliver quality products on time, without generating significant social unrest in the process. Nor is it necessarily wise to more than double Bolivia’s foreign debt at a time when the prices for the country’s principal export commodities, metals, minerals, and gas, are at record lows, with no relief in sight. One mystery is how the PRC plans to guarantee repayment of such risky business ventures. Chinese state officials and businesses need only look at the painful collapse of their other principal development partner in the region, Venezuela, to which China has lent more than US$65 billion. Bolivian voters have done well to look beyond the Zapata affair, but not ignore it. The current scandal is not just about Evo Morales, who has done much during the past decade to make the long-marginalised indigenous majority in Bolivia feel that they have a voice in the country’s politics. It is about choosing a path in which transparency and strong institutions ensure that the country most effectively leverages its resources and the help available to it, whether from China, Germany, or the U.S, to realise the legitimate dreams of national development and dignity in a pluralistic society.